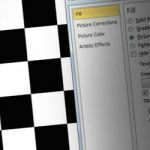 A graph paper, grid paper or plotting paper background in PowerPoint can be very useful by designers, architects or general users who need a plotting paper background or template system for their presentations. 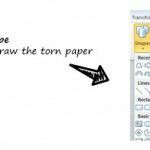 A graph paper can be created in different ways, we can either use a graph paper pattern in PowerPoint or create our own image as background. 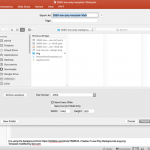 Then save the image as PNG or JPG and go to PowerPoint. 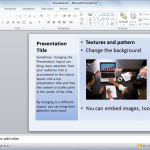 In PowerPoint you can embed the image and tile it horizontally and vertically. 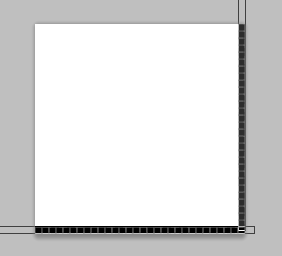 This way we can reproduce a grid in the PowerPoint background. Finally, we can adjust the tiling options in PowerPoint for example to add an offset, then scale it vertically or horizontally and add some transparency level. 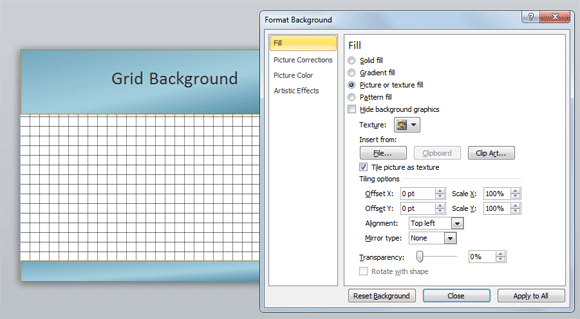 If this method is not suitable for you, then we encourage you to learn more in the article fill a grid background in PowerPoint. 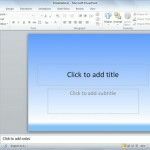 You can use this tutorial to create a PowerPoint template or any other presentation that requires a grid PPT background.